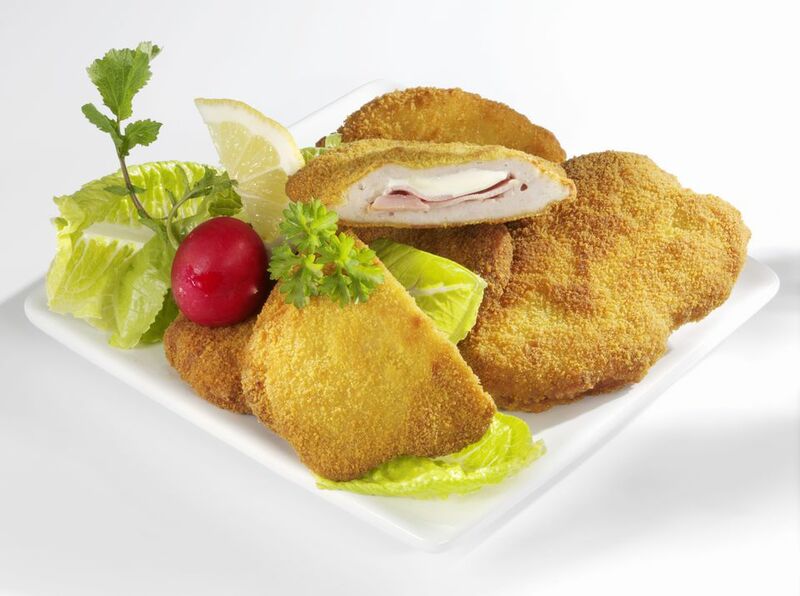 Schnitzel or şniţel is a popular main course in restaurants, fast food places, and homes across Romania. It is typical of the Austrian / German schnitzel but it can be made with any type of meat or poultry. This recipe for a type of schnitzel known as pork cordon bleu, or cordon bleu şniţel in Romanian, features pounded pork tenderloin filled with prosciutto or ham and cheese. Other popular Romanian filled schnitzel is the şniţel mozaic-rulat stuffed with two different thin meat layers, cheese, red peppers, and mushroom filling. And then there is the sniţel de ciuperci, a mushroom fritter. This recipe is a good candidate for very thinly sliced leftover ham. Cut pork tenderloin into eight equal slices. Pound each slice thinly between two pieces of plastic wrap. Lightly season both sides of each pounded cutlet with salt and pepper. Place a slice of prosciutto or ham and then a slice of cheese on each cutlet. Roll as you would for stuffed cabbage to completely enclose the filling. Dredge each rolled cutlet in flour. Then dip into egg-water mixture and then into bread crumbs, coating all sides. Heat a large skillet and add oil and butter. When sizzling but not browning, add cutlets and cook 10 to 12 minutes, turning to brown all sides. Serve two cutlets per person.